Noel's eyes have not improved during the first night at BC. Team Doctor Andrey has explained that very likely blood vessels have burst around the inners of Noels eyes, causing blood to leak into the eye which makes it impossible to focus. The Tibethan kitchen helpers are doubling as washing machines today and many climbers smell as new. The first beards are flying through the air and the optical age of the team goes down with decades per minute. The lunch is incredible again, not only is the delicious soup accompanied by warm cinnamon rolls, but we get watermelon slices for dessert. All of this is only the entrée for what is awaiting us tonight. 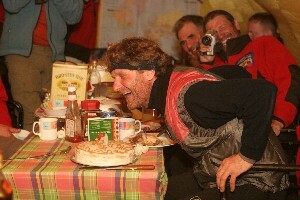 Yuri is celebrating his 50th birthday here at Everest BC, and the party will be remembered. Karo has sent off one of the locals to get a bunch of chickens yesterday and spent most of the day marinating them. The cooks have gone wild and serve not only great coleslaws and potatoe/carrot curry, but also delicious onion/garlic mix for the chicken and top it off with a real birthday cake. Nate, John, Marco, Victor and Sascha have returned today, so only Alex, Dimitri, Andrey, Lorenzo and Robert are missing at the party. Meanwhile nearly everybody at the table has toasted on Yuri's health, translated in English and Russian by Karo & Igor and accompanied by red wine and old Russian Bard music. Hope Noels feeling better and the Diamox are starting to kick in. Fingers crossed here! Your reports have become indispensible parts of the day - its become the first thing I look for in the mornings ( I had this same problem when Ellen McArthur was sailing the world).It does give us all a little taste of what you are going through. Good luck to you all for the coming days. Hope Noel's feeling more comfortable and on the mend. Lynne I hope your preparing ready supplies of Chicken Soup. Thinking about you both. Good luck. Hope that by the time you read this Noel's condition will have improved greatly. Mum and Dad send their love. Great job describing the days of April 20th - April 25th! We are all hoping that Noel's eyes will heal quickly and that he will be able to continue this assent of Everest with all of you. What a difficult situation for Noel. Please let him know that we are all thinking of him. Hi Lynne & Noel, sorry to hear of Noels eye problem heres hoping they will improve quickly. The reports from Everest are fascinating reading and give a glimpse of a world us armchair travellers :eek) back home can only dream about. Love and prayers to you both. C'MON THE ULSTERMAN( AND WOMAN). A message for Yuri in Russian. I hope it will translate correctly! Sorry to hear about Noel's eyes. Hope they're much better today. The girlies in Boots Belfast all send lots of love and best wishes. We think and talk about you every day. Speak to you soon. Luv, Thelma. All the Mackey's are cheering you on. Praying for your success, and your entire team's success. Hope you are not suffering too much from the headaches and high altitude. You are our hero! ps: Harry, great job on the write ups. Sorry to hear about Noels eyes! Hope you are well, thinking of you every day and trying to raise as much money as possible for you. Hope the eyes have started to improve. We are thinking of you both, please take care. I want to echo congrats for the excellent reports you managed acquire from Harry - great job!! Like all the other NI folk on here, am concerned for Noel and I hope the problem with the eyes do not cause a premature end to his expedition. Thinking of you both - take care! Thanks Colin, all I do is post the stuff that he sends me. Hope you enjoy the pictures that I'm adding just now! Compliments for you on the thirty-something posts a day! I keep spamming harry's mailbox with your posts, so his account may run out soon. He's very happy to read the messages from the 'real world' though, as according to him it does get lonely sometimes on that giant rock! I see you are still up at this late hour (1:26am in N Ireland). I have work tomorrow but I needed to catch up on the posts - missed a couple of days there. Just looking at the pictures you posted - they are great and add significantly to the story of the expedition (it is nice to put faces to the names). I hope Harry's account doesn't run out!! He'll be blocking my messages with an anti-spam filter if I'm not careful. Catch you later - feel free to IM me! !